The article below has been re-posted here because it has now been retracted. Although it underplays the severity of the radiation levels reached at the reactors it gives a good explanation as to the dangers from nuclear reactors in a melt down versus a core explosion. It gives the best explanation of the reactor safety systems and information regarding irradiated seawater etc. Clearly his idea of you is "you" is an interesting one. Does he mean Americans? Does he mean anybody more than 100 miles away from the plant in which case his statements are true. However I suspect there will be deaths as a result of radiation from the plant. Apparently now this article has been retracted. Given that it is more informative than many other lengthy opinionated articles written by those who don't even have any physics to back them up, I say it stays. Here it is. But here also is the critique of the article below but it simply discredits the source rather than dealing with the issues. This was originally posted as a comment on Japan Death Toll Climbs Astronomically As Nuclear Crisis Spreads. UPDATE: We have learned that this was written by Dr. Josef Oehmen, a research scientist at MIT. It was originally posted here. I repeat, there was and will *not* be any significant release of radioactivity from the damaged Japanese reactors. By "significant" I mean a level of radiation of more than what you would receive on - say - a long distance flight, or drinking a glass of beer that comes from certain areas with high levels of natural background radiation. I have been reading every news release on the incident since the earthquake. There has not been one single report that was accurate and free of errors (and part of that problem is also a weakness in the Japanese crisis communication). By “not free of errors” I do not refer to tendentious anti-nuclear journalism – that is quite normal these days. By “not free of errors” I mean blatant errors regarding physics and natural law, as well as gross misinterpretation of facts, due to an obvious lack of fundamental and basic understanding of the way nuclear reactors are build and operated. I have read a 3 page report on CNN where every single paragraph contained an error. The Zircaloy casing is the first containment. It separates the radioactive fuel from the rest of the world. The core is then placed in the “pressure vessels”. That is the pressure cooker we talked about before. The pressure vessels is the second containment. This is one sturdy piece of a pot, designed to safely contain the core for temperatures several hundred °C. That covers the scenarios where cooling can be restored at some point. The entire “hardware” of the nuclear reactor – the pressure vessel and all pipes, pumps, coolant (water) reserves, are then encased in the third containment. The third containment is a hermetically (air tight) sealed, very thick bubble of the strongest steel. The third containment is designed, built and tested for one single purpose: To contain, indefinitely, a complete core meltdown. For that purpose, a large and thick concrete basin is cast under the pressure vessel (the second containment), which is filled with graphite, all inside the third containment. This is the so-called "core catcher". If the core melts and the pressure vessel bursts (and eventually melts), it will catch the molten fuel and everything else. It is built in such a way that the nuclear fuel will be spread out, so it can cool down. Fundamentals of nuclear reactions: The uranium fuel generates heat by nuclear fission. Big uranium atoms are split into smaller atoms. That generates heat plus neutrons (one of the particles that forms an atom). When the neutron hits another uranium atom, that splits, generating more neutrons and so on. That is called the nuclear chain reaction. Now, just packing a lot of fuel rods next to each other would quickly lead to overheating and after about 45 minutes to a melting of the fuel rods. It is worth mentioning at this point that the nuclear fuel in a reactor can *never* cause a nuclear explosion the type of a nuclear bomb. Building a nuclear bomb is actually quite difficult (ask Iran). In Chernobyl, the explosion was caused by excessive pressure buildup, hydrogen explosion and rupture of all containments, propelling molten core material into the environment (a “dirty bomb”). Why that did not and will not happen in Japan, further below. In order to control the nuclear chain reaction, the reactor operators use so-called “moderator rods”. The moderator rods absorb the neutrons and kill the chain reaction instantaneously. A nuclear reactor is built in such a way, that when operating normally, you take out all the moderator rods. The coolant water then takes away the heat (and converts it into steam and electricity) at the same rate as the core produces it. And you have a lot of leeway around the standard operating point of 250°C. The challenge is that after inserting the rods and stopping the chain reaction, the core still keeps producing heat. The uranium “stopped” the chain reaction. But a number of intermediate radioactive elements are created by the uranium during its fission process, most notably Cesium and Iodine isotopes, i.e. radioactive versions of these elements that will eventually split up into smaller atoms and not be radioactive anymore. Those elements keep decaying and producing heat. Because they are not regenerated any longer from the uranium (the uranium stopped decaying after the moderator rods were put in), they get less and less, and so the core cools down over a matter of days, until those intermediate radioactive elements are used up. This residual heat is causing the headaches right now. So the first “type” of radioactive material is the uranium in the fuel rods, plus the intermediate radioactive elements that the uranium splits into, also inside the fuel rod (Cesium and Iodine). There is a second type of radioactive material created, outside the fuel rods. The big main difference up front: Those radioactive materials have a very short half-life, that means that they decay very fast and split into non-radioactive materials. By fast I mean seconds. So if these radioactive materials are released into the environment, yes, radioactivity was released, but no, it is not dangerous, at all. Why? By the time you spelled “R-A-D-I-O-N-U-C-L-I-D-E”, they will be harmless, because they will have split up into non radioactive elements. Those radioactive elements are N-16, the radioactive isotope (or version) of nitrogen (air). The others are noble gases such as Xenon. But where do they come from? When the uranium splits, it generates a neutron (see above). Most of these neutrons will hit other uranium atoms and keep the nuclear chain reaction going. But some will leave the fuel rod and hit the water molecules, or the air that is in the water. Then, a non-radioactive element can “capture” the neutron. It becomes radioactive. As described above, it will quickly (seconds) get rid again of the neutron to return to its former beautiful self. 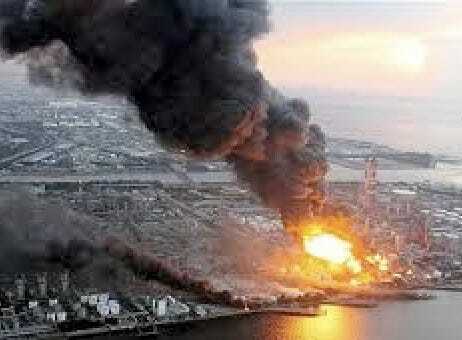 What happened at Fukushima I will try to summarize the main facts. The earthquake that hit Japan was 7 times more powerful than the worst earthquake the nuclear power plant was built for (the Richter scale works logarithmically; the difference between the 8.2 that the plants were built for and the 8.9 that happened is 7 times, not 0.7). So the first hooray for Japanese engineering, everything held up. When the earthquake hit with 8.9, the nuclear reactors all went into automatic shutdown. Within seconds after the earthquake started, the moderator rods had been inserted into the core and nuclear chain reaction of the uranium stopped. Now, the cooling system has to carry away the residual heat. The residual heat load is about 3% of the heat load under normal operating conditions. The earthquake destroyed the external power supply of the nuclear reactor. That is one of the most serious accidents for a nuclear power plant, and accordingly, a “plant black out” receives a lot of attention when designing backup systems. The power is needed to keep the coolant pumps working. Since the power plant had been shut down, it cannot produce any electricity by itself any more. When designing a nuclear power plant, engineers follow a philosophy called “Defense of Depth”. That means that you first build everything to withstand the worst catastrophe you can imagine, and then design the plant in such a way that it can still handle one system failure (that you thought could never happen) after the other. A tsunami taking out all backup power in one swift strike is such a scenario. The last line of defense is putting everything into the third containment (see above), that will keep everything, whatever the mess, moderator rods in our out, core molten or not, inside the reactor. When the diesel generators were gone, the reactor operators switched to emergency battery power. The batteries were designed as one of the backups to the backups, to provide power for cooling the core for 8 hours. And they did. Within the 8 hours, another power source had to be found and connected to the power plant. The power grid was down due to the earthquake. The diesel generators were destroyed by the tsunami. So mobile diesel generators were trucked in. This is where things started to go seriously wrong. The external power generators could not be connected to the power plant (the plugs did not fit). So after the batteries ran out, the residual heat could not be carried away any more. At this point the plant operators begin to follow emergency procedures that are in place for a “loss of cooling event”. It is again a step along the “Depth of Defense” lines. The power to the cooling systems should never have failed completely, but it did, so they “retreat” to the next line of defense. All of this, however shocking it seems to us, is part of the day-to-day training you go through as an operator, right through to managing a core meltdown. It was at this stage that people started to talk about core meltdown. Because at the end of the day, if cooling cannot be restored, the core will eventually melt (after hours or days), and the last line of defense, the core catcher and third containment, would come into play. But the goal at this stage was to manage the core while it was heating up, and ensure that the first containment (the Zircaloy tubes that contains the nuclear fuel), as well as the second containment (our pressure cooker) remain intact and operational for as long as possible, to give the engineers time to fix the cooling systems. Because cooling the core is such a big deal, the reactor has a number of cooling systems, each in multiple versions (the reactor water cleanup system, the decay heat removal, the reactor core isolating cooling, the standby liquid cooling system, and the emergency core cooling system). Which one failed when or did not fail is not clear at this point in time. So imagine our pressure cooker on the stove, heat on low, but on. The operators use whatever cooling system capacity they have to get rid of as much heat as possible, but the pressure starts building up. The priority now is to maintain integrity of the first containment (keep temperature of the fuel rods below 2200°C), as well as the second containment, the pressure cooker. In order to maintain integrity of the pressure cooker (the second containment), the pressure has to be released from time to time. Because the ability to do that in an emergency is so important, the reactor has 11 pressure release valves. The operators now started venting steam from time to time to control the pressure. The temperature at this stage was about 550°C. This is when the reports about “radiation leakage” starting coming in. I believe I explained above why venting the steam is theoretically the same as releasing radiation into the environment, but why it was and is not dangerous. The radioactive nitrogen as well as the noble gases do not pose a threat to human health. At some stage during this venting, the explosion occurred. The explosion took place outside of the third containment (our “last line of defense”), and the reactor building. Remember that the reactor building has no function in keeping the radioactivity contained. It is not entirely clear yet what has happened, but this is the likely scenario: The operators decided to vent the steam from the pressure vessel not directly into the environment, but into the space between the third containment and the reactor building (to give the radioactivity in the steam more time to subside). The problem is that at the high temperatures that the core had reached at this stage, water molecules can “disassociate” into oxygen and hydrogen – an explosive mixture. And it did explode, outside the third containment, damaging the reactor building around. It was that sort of explosion, but inside the pressure vessel (because it was badly designed and not managed properly by the operators) that lead to the explosion of Chernobyl. This was never a risk at Fukushima. The problem of hydrogen-oxygen formation is one of the biggies when you design a power plant (if you are not Soviet, that is), so the reactor is build and operated in a way it cannot happen inside the containment. It happened outside, which was not intended but a possible scenario and OK, because it did not pose a risk for the containment. So the pressure was under control, as steam was vented. Now, if you keep boiling your pot, the problem is that the water level will keep falling and falling. The core is covered by several meters of water in order to allow for some time to pass (hours, days) before it gets exposed. Once the rods start to be exposed at the top, the exposed parts will reach the critical temperature of 2200 °C after about 45 minutes. This is when the first containment, the Zircaloy tube, would fail. And this started to happen. The cooling could not be restored before there was some (very limited, but still) damage to the casing of some of the fuel. The nuclear material itself was still intact, but the surrounding Zircaloy shell had started melting. What happened now is that some of the byproducts of the uranium decay - radioactive Cesium and Iodine - started to mix with the steam. The big problem, uranium, was still under control, because the uranium oxide rods were good until 3000 °C. It is confirmed that a very small amount of Cesium and Iodine was measured in the steam that was released into the atmosphere. It seems this was the “go signal” for a major plan B. The small amounts of Cesium that were measured told the operators that the first containment on one of the rods somewhere was about to give. The Plan A had been to restore one of the regular cooling systems to the core. Why that failed is unclear. One plausible explanation is that the tsunami also took away / polluted all the clean water needed for the regular cooling systems. The water used in the cooling system is very clean, demineralized (like distilled) water. The reason to use pure water is the above mentioned activation by the neutrons from the Uranium: Pure water does not get activated much, so stays practically radioactive-free. Dirt or salt in the water will absorb the neutrons quicker, becoming more radioactive. This has no effect whatsoever on the core - it does not care what it is cooled by. But it makes life more difficult for the operators and mechanics when they have to deal with activated (i.e. slightly radioactive) water. But Plan A had failed - cooling systems down or additional clean water unavailable - so Plan B came into effect. This is what it looks like happened: In order to prevent a core meltdown, the operators started to use sea water to cool the core. I am not quite sure if they flooded our pressure cooker with it (the second containment), or if they flooded the third containment, immersing the pressure cooker. But that is not relevant for us. The point is that the nuclear fuel has now been cooled down. Because the chain reaction has been stopped a long time ago, there is only very little residual heat being produced now. The large amount of cooling water that has been used is sufficient to take up that heat. Because it is a lot of water, the core does not produce sufficient heat any more to produce any significant pressure. Also, boric acid has been added to the seawater. Boric acid is "liquid control rod". Whatever decay is still going on, the Boron will capture the neutrons and further speed up the cooling down of the core. The plant came close to a core meltdown. Here is the worst-case scenario that was avoided: If the seawater could not have been used for treatment, the operators would have continued to vent the water steam to avoid pressure buildup. The third containment would then have been completely sealed to allow the core meltdown to happen without releasing radioactive material. After the meltdown, there would have been a waiting period for the intermediate radioactive materials to decay inside the reactor, and all radioactive particles to settle on a surface inside the containment. The cooling system would have been restored eventually, and the molten core cooled to a manageable temperature. The containment would have been cleaned up on the inside. Then a messy job of removing the molten core from the containment would have begun, packing the (now solid again) fuel bit by bit into transportation containers to be shipped to processing plants. Depending on the damage, the block of the plant would then either be repaired or dismantled.